The meeting came despite the US formally recognising Libya’s opposition as its legitimate government last week. 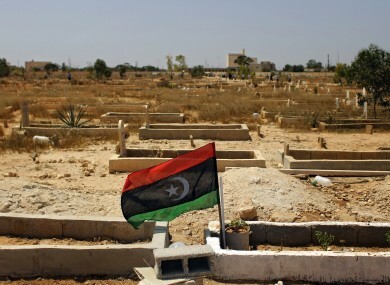 The flag of the Libyan opposition at the grave of a rebel killed in recent fighting. US OFFICIALS HAVE met face-to-face with representatives of Muammar Gaddaffi’s regime last weekend to underscore the Obama administration’s commitment to seeing the longtime Libyan leader leave power, according to two US officials. The meeting was not a negotiating session and there were no plans to meet with the Gaddafi regime again, the officials said told AP. The meeting followed a decision Friday by the US and several other nations to formally recognise Libya’s main opposition group as the country’s legitimate government, a major boost for the rebel movement. A senior US official traveling with Secretary of State Hillary Clinton in India said the US agreed to meet the Libyans only after the US officially recognised the rebels. The meeting followed what the official described as several phone calls from Libyan officials that the US interpreted as a misguided attempt to repair relations. The official said the meeting took place Saturday in an unnamed third country and brought together three senior US diplomats, including Jeffrey D. Feltman, the top State Department official in charge of Middle East policy, along with four members of Gaddafi’s inner circle. A Gaddafi spokesman said the meeting happened in Tunisia. Both US officials who detailed the meeting said the Obama administration’s purpose for the session was to deliver a clear and firm message that the only way forward in Libya is for Gaddafi to step down. The U.S. officials requested anonymity because they were not authorized to discuss the meeting publicly. Gaddafi’s regime said the talks were focused on repairing ties between the nations. That account was denied by the US. Under the cover of a UN mandate, the US took the lead in the airstrikes against Libyan forces that began in March to protect Libyan civilians from Gaddafi’s advancing forces. NATO has since taken the lead in the bombing campaign, with the US playing a support role. Though President Barack Obama has pledged that the Libya campaign will not turn into a protracted war, he has said the US will continue its involvement until Gaddafi stops attacking his people. Email “US meets with Gaddafi representatives - but it won’t happen again”. Feedback on “US meets with Gaddafi representatives - but it won’t happen again”.